TAS adult programs are great for both recreational and serious tennis players who want to take their game to the next level! 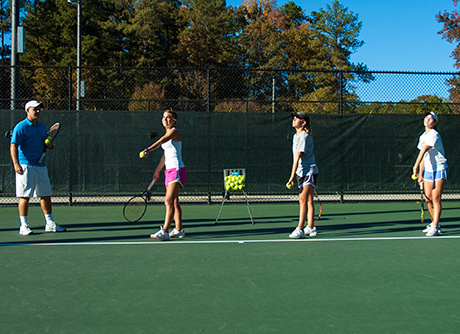 TAS offers tennis training programs for ALTA and USTA team play. The training is individualized to fit the needs, ability level, and commitment level of each team. TAS uses a 3 part system to train ALTA/USTA teams. The 3 parts are the physical aspects of the game, the mental, and the emotional. Each area feeds off the other and players are taught specifically how to develop these skills. Intensive on court drilling to make shot execution and selection second nature. All drilling feeds directly back match tactics and strategy. MENTAL: 1) how to play the score, 2) how to move with the flow of the ball, hit the right shot at the right time, and then follow the line of the ball to cover the next shot, 3) learn how to play your game style and then how to defend against varying game styles. EMOTIONAL: 1) how to handle adversity, 2) cheating, 3) how to close out matches, 4) playing against difficult personalities, and 5) breathing and imagery techniques to quiet your mind and relax your body. TAS has pros on staff certified by the United States Professional Tennis Association (USPTA). TAS breaks the game into 3 parts. They are the physical, mental, and the emotional aspects of the game. The certified staff meets with each student and creates a developmental plan to build the strengths, and protects the weaknesses of the player's game. Every player has natural strengths and weaknesses. The staff uses specific mental imagery techniques for training the nationally ranked juniors to build mental toughness. TAS has a certified staff to offer students off court physical conditioning programs that will enhance their on court game. TAS has a number of adults who play in state, regional, and national tournaments where the staff offers coaching to these students. The staff also offers league play teams coaching for their individual matches. Students pay a TAS pro directly for all private lessons and services listed above. Fees range from $65-$90 per hour for private lessons and league play match coaching. Call the TAS business office at 404-668-7623 with any questions!